What Day Of The Week Is May 23? 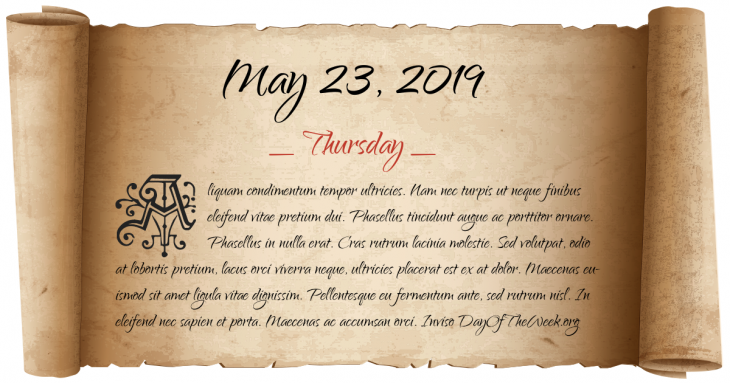 May 23, 2019 is the 143rd day of the year 2019 in the Gregorian calendar. There are 222 days remaining until the end of the year. The day of the week is Thursday. Official ratification of the Second Charter of Virginia takes place. After being convicted of piracy and of murdering William Moore, Captain William Kidd is hanged in London. Battle of Ramillies: John Churchill, 1st Duke of Marlborough, defeats a French army under Marshal Villeroi. American Civil War: Sergeant William Harvey Carney becomes the first African American to be awarded the Medal of Honor, for his heroism in the Assault on the Battery Wagner in 1863. Egypt closes the Straits of Tiran and blockades the port of Eilat at the northern end of the Gulf of Aqaba to Israeli shipping. The “55 parties” clause of the Kyoto protocol is reached after its ratification by Iceland. Part of Paris-Charles de Gaulle Airport’s Terminal 2E collapses, killing four people and injuring three others. Who were born on May 23?